From May 8-11, 2018, Ceramics of Italy will bring an impressive contingent to Atlanta for the 29th edition of Coverings – the largest international tile and stone exhibition in North America. Organized by Confindustria Ceramica (the Italian Association of Ceramics) with support from the Italian Ministry of Economic Development, the Ceramics of Italy pavilion will feature 76 booths with over 120 member brands introducing new collections that demonstrate impressive advancements in technology with a thoughtful focus on design trends. Returning for another year, the beloved Ceramics of Italy central stand, Strada Dinamica, will continue to serve as the focal point for the pavilion with an information hub and authentic Italian cafe. Ceramics of Italy will also participate in several educational sessions and commemorate the history of Italian tile in North America with a special event and film honoring the 25th anniversary of the Tile Competition. With a focus on tradition while celebrating the past and simultaneously looking towards the future, the Italian Pavilion promises to lead in exciting new products and innovations during the show. Strada Dinamica, the Ceramics of Italy booth located in Hall B3, 1630, is modeled after a busy urban sidewalk and includes benches, standing communal tables and two large kiosks, which house a cafe, coffee bar and information desk. Designed by New York firm e+i studio, the swooping, wave-like motions and organic curvature throughout the space create an inviting, modernist aesthetic reminiscent of Italian futurism. 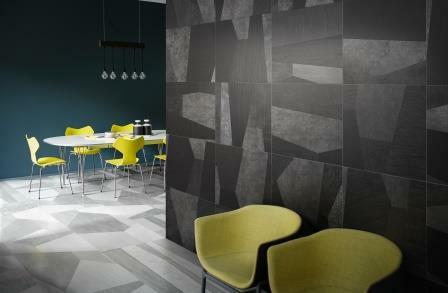 Several members companies contributed products to bring the Italian streetscape to life including Florim, whose Magnum Oversize collection demonstrates the versatility of thin porcelain slabs, and Lea Ceramiche whose large format floor tiles are set on a raised flooring system by Newfloor Srl Raised Floors. Fila Surface Care Solutions also provided cleaning products for the booth. Conveying a sense of motion and natural flow, the booth welcomes visitors to step up and explore the space while learning more about the Italian tile industry. Ceramics of Italy’s beloved culinary partner, Spuntino Catering will continue serving a taste of la dolce vita in Strada Dinamica throughout the show. The Italian pavilion will be full of inspiration and innovation this year, as dozens of Italian brands exhibit their latest collections, highlighting their extensive understanding of architects’ and designers’ needs. Modern developments such as large format tiles continue to be popular with more options in 6mm ultra-thin and large collections that range from metal to stone and marble designs. Outdoor pavers and exterior cladding tiles will also demonstrate the holistic approach to product design that many Italian companies share. Companies also continue to expand upon popular trends like terrazzo and nostalgia-inspired tiles while others experiment with new techniques to create painted effects and combine categories of materials such as marble and wood looks in one design. Digital printing advancements will be seen as patterns become more intricate and colors become richer, with wallpaper-like effects achieved in a tile format. Examples of these advancements include botanical inspired motifs and weathered looks perfected to capture the natural passage of time. The variety of trends shown within the pavilion are sure to impress and inspire visitors at the show. Visitors are encouraged to follow the distinguishable “Made in Italy” trademark throughout the show to find products of superior quality and environmental responsibility. For the ninth consecutive year, Ceramics of Italy is a proud sponsor of the Installation Design Showcase (IDS) – an interactive exhibit and initiative that aims to pair Italian ceramics in tandem with creative design and expert installation. This year, Coverings partnered with Bear Tiny Homes; a Georgia-based company that builds tiny homes focused on accessibility. Ceramics of Italy is working with designers from Johnson Studio at Cooper Carry and installers from Visalia Ceramic Tile to bring a luxe cottage concept to life. 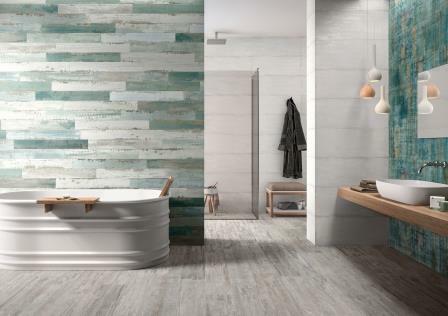 A wide range of Italian products will be used throughout the space, from wood-look planks to tiles rich in texture, culminating in an intimate, rustic-modern escape. Member companies generously provided tiles for the installation while Mapei supplied the grout. The Tiny Home will be open throughout the show for visitors to see the space come together in real-time. To celebrate the finished product, attendees are invited to attend IDS: Deconstructed (Thursday, May 10 at 3pm) in Hall C, Booth 8804 to explore the completed home and ask questions from the design and installation team. In honor of the 25th anniversary of the Tile Competition, Ceramics of Italy will organize a special event on May 9 at 12:30pm in Room B401 titled “Ceramics of Italy Celebrates 25 Years of Design”. Architects, designers and tile industry professionals are invited to attend a private Italian lunch and exclusive first look of the film Timeless Tiles: The Italian Legacy, directed by Francesca Molteni and architectural historian Fulvio Irace, featuring projects and interviews from notable architects throughout North America. 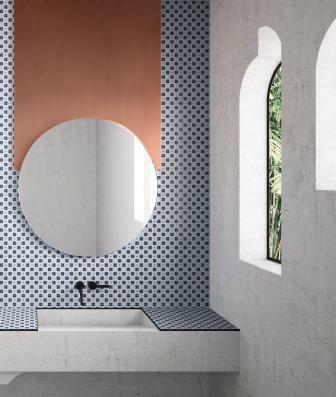 Afterwards, Edie Cohen, Deputy Editor at Interior Design, will moderate a discussion on Italian tile and its role in thoughtfully conceived architecture and design with guest speakers from Studio Libeskind, Ziger/Snead Architects, ZAS Architects and others. The afternoon will conclude with a guided walking tour of the Ceramics of Italy Pavilion where over 120 Italian brands will demonstrate the latest trends and innovations in tile. 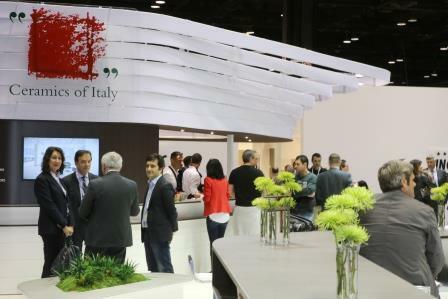 Interested participants can register at bit.ly/CeramicsOfItaly25 and on-site in the Ceramics of Italy booth. As thought leaders in the industry, representatives from Ceramics of Italy will participate in several educational sessions that are part of the show’s extensive conference program. On Wednesday, May 9 at 8am in Room B312, experts including Andrea Contri, Sustainability Manager at Confindustria Ceramica, will present “Health, Safety, Environment, Design: Specifying Tile in Today’s Sustainability Landscape.” The session will provide an in-depth look at how the industry can combine sustainability messaging and various specification tools into a package. Afterwards, at 9:30am in Room B309, Cristina Faedi, Manager of Promotional Activities for Ceramics of Italy, will discuss “Global Tile Trends” which covers material innovations, creative applications and how they can transform the installation of tile. Donato Grosser, MBA, President of D. Grosser and Associates, Ltd., together with Santo Torcivia, President, Marketing Insights, LLC, will break down the ceramic tile marketplace, providing attendees with valuable insight and guidance to be a competitive company in a lecture called “How Ceramic Tile Has and Is Forecast to Compete with Other Products”. Taking place at 3pm on Wednesday, May 9 in Room B308, the industry experts will share the drivers of growth and how ceramic tile compares to other products such as LVT and wood by sales history, room application, price point, market segment and other essential factors. More information about Coverings can be found here. 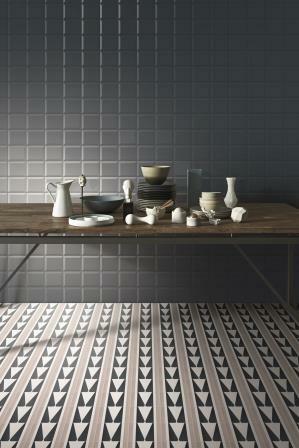 For more information about Italian ceramic tiles, visit here.